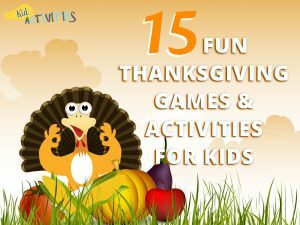 These Thanksgiving games for kids are sure to make the holiday a memorable one. These games can be played at the dinner table while you wait or even while you eat. With these fun games you are sure to have hours of fun and laughter. Take a Thanksgiving related word such as: Thanksgiving, Mayflower, Cornucopia, etc. and find as many little words as possible within before the timer runs out. 1. All children stand in pairs holding hands and facing each other. 3. One child is NOT with a pair and in the ‘barnyard’. This ‘free’ turkey is roaming. 4. At a signal,(such as Gobble, Gobble, Gobble) all turkeys leave their barnyard and run for safety to another barnyard. One turkey will be left over and not be able to find a barnyard to enter. 5. Depending on the number of players-continue until all (or many) have had time to be a left-over turkey! 4. WHERE IS MR. TURKEY? Instead of saying “warmer or cooler” you gobble! One player is the hunter and the others are helpers. The hunter leaves the room. The helpers hide a small toy turkey or a turkey cut-out, or laminated drawing, etc. The hunter returns with a mission to find the turkey. Helpers give clues by “gobbling” like turkeys. If the hunter is not close, the helpers gobble very quietly. As the hunter gets closer, the helpers gobble more and more loudly until Mr. Turkey is found! On a dozen or more index cards, draw or paste a picture of a turkey. The amount of cards you will have depends on the number of children you have–and how many groups they will be divided into. Each group should consist of about 12 hunters (children) and 12 cards. 1. To play, everyone leaves the room except the leader. The leader hides the cards around the room. Hunters return and begin the hunt. 2. As each turkey is found, it is brought back to the leader who corrals them in a separate pile for each hunter. When all the turkeys have been found, the hunter with the most turkeys is the winner and becomes the leader for the next round. This can be done in groups and groups work together! Each group would have a leader. Hide the turkey cards and then all hunters find cards that have been hid. The top finder in each Team-becomes the new leader for that Team. Let children make the cards before the Holiday. They’ll find lots of magazine pictures and can color some as well! Players sit on chairs forming a circle. There should be one more player than there are chairs. The player without a chair is the leader. The leader points to each of the other players to give them a name, such as “Cranberry, Corn, Apple, Turkey,” anything related to Thanksgiving. 3. Everyone, including the leader, then scrambles for a new place. 4. The player with out a seat is the new leader. More Info: The leader may give the same name to more than one person. You can make a mascot by taping a colored-paper turkey head to one end of a football. You can also simply stuff a brown bag with crumpled newspaper and draw on a face with colored markers. 1. In this wacky outdoor contest, team players join up with their elbows linked, and each team is handed a turkey mascot. 2. On cue, the pairs try to make their way to the finish line at the far end of the playing field. Divide the children into two teams (or as many as you need) and have them form two lines. You will need a cob of dried Indian corn for each team. 1. At the signal “go”, the corncob is to be passed from child to child. The catch is that they can use any part of their bodies, except their hands. 2. If the corn touches the ground at any time, it must go back to the beginning of the line again. 3. Whichever team manages to get the corn to the end of the line first wins the game. 4. The corn can also be used in a relay, with the kids putting the corn between their knees, and racing “crab” style”. 1. Use pieces of masking tape to make turkey footprints all over the floor. 3. Have children pretend to be turkeys and strut around the room. 4.When you stop the music, have the turkeys find footprints to stand on (one turkey to a footprint). 5. When you start the music again, have the turkeys continue strutting around the room. 11. THANKSGIVING DINNER GAME: This is good one to remember at line-waiting transition times. Players sit in a circle (or stand in a line because of waiting…) The first player starts by saying, “At Thanksgiving dinner I like to eat turkey”. The next player must repeat “At Thanksgiving dinner I like to eat turkey…” and add another dish. This continues all the way around the circle or down the line– with each student reciting the dishes in the exact order they have been given and then adding a new one. If a student makes a mistake they slide out of the circle or move to the front of the line and the game continues. The person left who can perfectly recite the Thanksgiving menu wins. First player: I’m going to Thanksgiving dinner and I’m having turkey. Second player: I’m going to Thanksgiving dinner and having turkey and sweep potatoes. etc. 1. Choose someone or something related to Thanksgiving. Suggestion: Make a flip chart with numbers from 1 to 20–so each time a question is asked –the number is flipped. This can also be played with other holidays/themes/seasons! You could also keep score by making 20 paper turkey feathers. Each time a question is asked, a feather is removed from the pile. Turn every day games into Thanksgiving Games! INSTEAD of Duck, Duck, Goose…play DUCK, DUCK, TURKEY! Play “PIN the WATTLE on the Turkey” instead of Pin the Tail on the Donkey. Where you’ll stop, nobody knows. What they are thankful for this day. say aloud, one thing for which they are thankful. This continues until everyone has had a turn. 1. Set-up: Write a joke on one card and a punch line on another. Be sure to mix the cards up. The number of different jokes depends on the size of the group. 2. Give each person a card. Explain that they may have a joke or a punch line on the card. When this is done, everyone can return to a circle and, with their partner, tell their joke. 15. PIE EATER TAG GAME! Good for October to December because of apple and pumpkin pies! Split the students into two different groups; one is apple pie and the other group is pumpkin pie. Have one student be the pie eater, who will be standing on the center line. The pie eater can only move from side to side on the center line. All the students say to the pie eater, “Pie eater, pie eater are you hungry?” The pie eater responds with a ‘yes or no’ answer. If the answer is no, the pies (students) ask again. The pie eater then says apple or pumpkin and that pie tries to make it to the other side. If the pie is tagged, then they become a pie eater. There you have it, 15 fun Thanksgiving games and activities for kids. We hope your holiday is filled with laughter and fun.